So Italians have voted primarily for the socialist, the corrupt philanderer and the comedian (whose main joke is that he isn't even standing because he has a conviction for manslaughter). The socialist opposes austerity, the philanderer opposes it too, promising to reverse tax increases and give everyone their money back (nice try) and the comedian wants to halve the working week and give everyone free internet access. For Italians to have bothered supporting any of these buffoons is comedy extraordinaire. Italians don't trust politicians or bankers much, but also are averse to change. It's why on the one hand public debt in Italy is over 120% of GDP its private debt is very low. Around 30% of Italians don't have bank accounts, because of a history with a Lira that past government simply inflated away, so they don't trust their savings with banks. Italians don't take our credit to pay for a holiday or a car, they save, they have tightly integrated families. There is a lot to be said for not borrowing to consume, and the tradeoff of the intact families is a female employment rate 12% lower than the EU average. Whether the stability of families offsets the loss of economic and human potential from low employment of women is a moot point. However, on the government side Italy is a disaster. It has had fiscal incontinence for many years, so needs to get spending under control. Mario Monti was the man appointed by the European Commission to sort the country out - and he was punished for that by his party coming a distant fourth. Not, because he is not respected, but because he was a tool of Brussels. The European Union, the great arrogant entity that proclaims whenever it can that it kept the peace in Europe, now has on its record the imposition of rule from Brussels upon a Member State. That wasn't going to last. Yet Italy's problems are deep and cancerous, with endemic corruption, of which Silvio Berlusconi is only the leading figurehead for. Of a labour market that would make unions in the UK, US, Australia and NZ groan with envy, but which effectively makes it nearly impossibly expensive to make people redundant, and so keeps so many Italian businesses just below the threshold for such a law to come into place. Let's say you own a building. Yes, I know that for some this concept of property rights is rather alien, but humour me for a moment. It's your building. You have a wall on the property line up against the footpath or another public space. If someone spray painted it you'd think that you had every right to do what you wish with your wall, as long as you don't put others at risk. You could leave it, remove it/paint over it, or even remove the wall right? No. You see this is exactly what has happened in Wood Green, London. The anonymous artist 'Banksy' had painted this image of a child working in sweatshop conditions making bunting. The owner of the building, a pair of property developers, cut out the wall to sell it at an art auction in the United States, sparking outrage. Locals were outraged considering that the art was "theirs", because it could be seen publicly. The sale was halted as even the FBI allegedly asked Scotland Yard to "investigate" according to the Evening Standard, but Scotland Yard has refused to investigate as it is not a criminal matter. The locals who thought a wall, that they didn't own, was theirs, managed to gee up a few local politicians, ever keen to hop on a bandwagon and treat property rights as ephemeral. Alan Strickland, a Labour councillor (big surprise) for Haringey has said he wants it returned. Local MP, Lynne Featherstone (Liberal Democrat - another party with little respect for private property rights) has also called for it to be returned asking "will we get it back"? Who is this "we"? Why do politicians think that just because a (relatively small) group of loud people demand other people's property that this is "ok"? Do they really think that the future of graffiti on a private wall should be put to public acclaim? Does it mean anyone can paint your external wall and if he gets a gang of locals and a couple of leftwing politicians on side, that you can't paint over it? I cannot believe it’s over graffiti on a wall that has caused this. We had a case with one of our buildings where we had graffiti and the council told us they would fine us over £1000 if we didn’t remove it.“The council have done nothing to protect it. They’ve not helped us in any way. They’ve just caused us more problems and more problems"
So on your own property, the council fines you if it doesn't like it, but then harasses if it does? It ought to be simple. 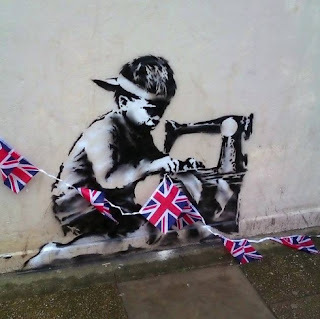 If Banksy (or anyone) chooses to paint on a wall of a building that he doesn't own (or without the permission of the owner), then he takes the risk that it is removed, obliterated or left as is. Bear in mind that using someone else's property temporarily is the crime of conversion, and that the painting may be seen as vandalism. Art it may be to some observers, but it isn't their property. You don't have the right to tell other people what they may do with their property. The owners were quite within the rights to ignore the baying crowd and remove the wall. The baying crowd that didn't offer to buy it, that didn't do anything to protect the wall, that are only too willing to demand something that isn't theirs becomes theirs. Cheered on by politicians that belong to parties that would tax the property owners every year to pay for the bloated states they support. Not one of them offering to buy the wall themselves with their own money, they just want to regulate and interfere. What of Banksy? Well if he wants his art to be protected then he might approach the property owners before he paints on their walls. Yes that "isn't the point" and is part of the anarchy that the anti-establishment loves, but property rights are important. Because when you can't control what you own, then you don't own it. So if he wants to be "pure", then accept that sometimes the property owners wont like it, sometimes they will accept it and sometimes they will say "thank you, that's our wall". Truth is stranger than fiction, and the editors of the Daily Mail and The Express cannot be disappointed at the discovery of Heather Frost, 37, who personifies the caricature of a welfare parasite (although the same can be said of the feckless sperm donors who abandoned their offspring in her). Don't worry, she is in the Daily Mirror as well. She "struggles" to live at taxpayers' expense, in two adjacent houses in Churchdown, Gloucestershire, with her 11 children, 2 grandchildren and unemployed partner Jake. She would love to have more children, but is sterile (due to cervical cancer), and says she is married. She also bought a horse and keeps it for one of her daughters, at £200 a month. Now none of this would matter if her and her kin were sustaining themselves or other people were sustaining them by choice. I couldn't care less if she wants to breed. However, this is a family that costs other people money, and not through ill fortune, but by lifestyle choice. In fact, this choice, facilitated by the generous UK welfare state, has given the woman the gall to demand more. She has been complaining to the council that the housing provided at the expense of others is inadequate, so the Council is now building a brand new house for the family at the price of £400,000. A true libertarian would cancel her benefits, tell her to get the money from the kids' dads, get a job and warn her that when the house she has asked for is built, it will be sold and the rent where she currently is will go up to market rates. It is easy to moan about this, but what is needed is answers and a broader reflection on why this happens, when it is blatantly goes against the values of most of the population. Quite simply, the incentives are set up to encourage this. Money and housing is offered in exchange for breeding, without employment and without a call upon the other party responsible for the breeding. The more breeding, the more money and the bigger the home. The quality of parenting (which would appear to be at least questionable) is irrelevant. Defenders of the status quo on the left would hold their hands up and say "what else can you do", and claim these cases are so rare that it is wrong to destroy or reform a system that makes these cases news because they are rare. Yet these very same people will protest and harass companies that legally seek to minimise their tax bills, and wonder why they do so? After all, if you invested your hard earned money in a business, would you want a penny of it going to the likes of Heather Frost? The culture bred by the welfare state is this one of entitlement, which isn't just about expecting the Council to give you a new house for nothing, but raising children who expect to never have to work, who are resentful of those who have worked and have things they want, and who believe that it is right to raise kids the same. Her eldest (21) already has a child of 2, who lives with them all. Consider the effect of promoting this culture has on business, employment, crime and society as a whole. Indeed the left ought to consider how it breeds undying resentment amongst the broad mass of people who resent being the host to the parasitical claims of those who choose to be unproductive. The only answer to this culture is to stop guaranteeing people every growing income for breeding and housing to accommodate it. Would Heather Frost have kept breeding if she knew she wouldn't get more money or a bigger house to accommodate the children? She claims that if she could have more children, she would. Maybe she would have named the fathers and they would have had a portion of their income taken to help pay? If she had been denied more money and housing for breeding, would the social services system let her raise the children in such poverty or take them away so they could be fostered or adopted? There are some relatively gentle responses that take us down the path of more individual responsibility. There is nothing new about the latest report from the Academy of Medical Royal Colleges calling for state intervention to prevent people getting fat. It demonstrates the fundamental error of people who are well intentioned, and intelligent, moving beyond their core expertise of medicine, into public policy and human behaviour. For example, virtually none of them realise that the price of food overall, including fruit, vegetables, meat, dairy products and fish would fall, if the quotas and tariffs imposed by the Common Agricultural Policy were abolished (which do not apply to highly processed sugary foods made in the EU). However, that requires an understanding of public policy beyond health into trade. Bear in mind the largest UK recipient of EU agricultural subsidies in recent years is sugar refiner and retailer Tate & Lyle. The doctors also seem to have ignored the Danish fat tax failure, unless they think the problem was taxing fat, not sugar. Danes introduced a classless fat tax, which of course meant gourmet cheeses and butter got hit the highest, and many Danes simply took to fat tax evasion trips into Germany to stock up on their favourite foods. Doctors in the UK presumably think a sugar tax could only target the products they disapprove of (not be based on all simple sugars in products) and would avoid encouraging people to shop internationally (Northern Ireland would be home to a new black market in smuggled Coca Cola). Policy experts? Hardly. You see the key obesity problem is not the lack of hectoring, lack of information or lack of laws to make people do what they want, but a culture of irresponsibility and a lack of medical understanding as to why people behave in ways that make them overweight. What is particularly galling is the implication that it is only certain foods, perceived to be "junk" consumed by the poorer classes, that are the problem. In fact, if people predominantly ate the rich, butter intensive foods of some celebrity chefs, in particular their butter and sugar laden desserts, they would also be obese. However, it is perceived that the people who will bother to make such foods or eat out, know how to look after themselves. This battle against obesity is one about class. For the wealthy man who loves steaks, Beaujolais, chocolate mousse and fine cheeses is not the target of the hectoring doctors - even though such a person equally faces a risk of heart attack as the poorer man who loves fish and chips, chocolate and beer. Yet it is abundantly clear from the communications behind these reports that it is the latter that is targeted, presumably because the latter person is not thought to be competent, but the former "understandably enjoy delicious high fat high sugar foods". Most of the proposals outlined reinforce a culture of irresponsibility, and the hectoring culture whereby doctors think people will do what is "right" if only they keep telling them to do so. The implicit message is that it is only one group that is irresponsible, and it is not those doctors socialise with. So I'll rank the proposals from least to most acceptable based on qualitative measures of promoting responsibility and preserving individual freedom. As was fully expected, Kim Jong Un has shown off that just because dad died, the DPRK still can pack a nuclear punch. It follows the satellite launch in December of Kwangmyongsong 3-2, which is widely thought to have also been a display of rocket technology might that could be used to launch missiles. It's useful to largely ignore the hyperbolic Western media on this, driven partly because the DPRK has understandably being caricatured as some weird insane little country with a silly leader who does crazy things. I understand that caricature, but it is deceptively simplistic. Weird dictatorship, bad man who likes showing off his military might, but as this week's Economist reports, the reality on the ground in the country is quite different. For example, despite the rhetoric, it is comparatively easy (though not cheap) to travel to the DPRK. You see, the DPRK has gone through a cycle of provocation, isolation, face saving dialogue, engagement and then provocation, since Kim Il Sung died. It doesn't demonstrate a genuine desire to wage war with its neighbours, rather it is a technique to extract booty from them, like a truculent child who wants attention, and has a tantrum when you stop giving it any. You can't blame Kim Jong Un, because it worked for his father. A foreigner visiting or moving to the UK discovers soon after arrival that, unlike any other country, there is a remarkable pride and enthusiasm over its state owned, operated and (pretty much) fully taxpayer funded health service. The initials NHS are more than just a state institution or a public service, but hold a near sacred status in the UK public zeitgeist about healthcare. You saw it in the London 2012 Olympics Opening Ceremony, directed by the leftwing Danny Boyle, who decided to celebrate the NHS as something distinctly British to be proud of. It seems, given that universal health care is pretty much universal in the developed world (even the US has only had a small minority excluded from health care), a trifle odd. Setting aside the issues of the United States, there are no fundamental issues of access to health care elsewhere in the developed world, even though it is difficult to find other countries that adopt the NHS model - whereby the users never pay for anything (except nominal prescription, dental and optical services fees for some), where there is little choice of provider (your choice is dependent on where you live and you cannot travel to select a different primary health provider) and funding flows from a centrally planned and directed system to mostly state owned providers. If it does say so itself! Now I am not one to accept on face value a report commissioned by an industry sector for political lobbying purposes. For that is exactly what the report on Air Passenger Duty is. So, it is not unreasonable to be sceptical about some elements of the analysis. The Treasury has completely dismissed them, as has the leftwing environmental lobby group AirportWatch. Treasury's view is simple, as scrapping air passenger duty would reduce the tax take to government by up to £4 billion a year. The assumption is that the people who would retain that money couldn't possibly spend it as wisely as Her Majesty's government. Business travellers and tourists, both local and foreign, would presumably be expected to fritter away their money on such trivialities as goods and services they want, or to save/invest in businesses or for later capital or consumption goods (most of which will generate tax as income or in consumption). The leftwing anti-aviation environmentalists of course believe that more money spend on state institutions like the NHS, Police and schools must be a better good than people keeping their own money. However, part of the argument against scrapping Air Passenger Duty is purely mercantilist. Air Passenger Duty reduces the incidence of British residents engaging in overseas tourism. The UK has a "tourism trade deficit" which essentially means that Britons spend more in travelling abroad than foreigners spend on their trips to the UK. More curiously is that this deficit only exists outside London, so that despite the preponderance of London origin business traffic, most inbound tourism expenditure is in London. In short, tourism is part of London's economy in a positive way. The rest of the UK generates a "tourism trade deficit", because the number of locals (outside London) flying overseas for holidays is not offset by foreigners visiting those areas. In short, foreigners don't come to Britain to visit Birmingham, Manchester or even Scotland and Wales in sufficient numbers, or spending enough money to compensate for the locals keen to flee. So what? If Britons can afford to go on holiday to foreign countries it is something to celebrate. They spend money on holidays to Spain, Italy, France, the United States or wherever, because they get more utility out of that than spending it on a holiday to the Isle of Wight, the Lake District or Skye. It isn't a direct financial benefit to the UK, but they enjoy themselves. That freedom to enjoy life, to visit where you want with your own money is none of the business of the government. Treasury acts as if the money spent by UK residents on overseas trips is a loss that it should be concerned about. That's simply wrong. It isn't your money, and the people who return from these holidays are refreshed invigorated and are more likely to be productive, happier citizens, who work hard, raise happy families and are less of a burden upon others. Abolition of Air Passenger Duty would increase UK inbound tourism and outbound. The inbound is a win for the economy, the outbound is a win for residents, and the inbound win may offset the shift of UK residents holidaying overseas instead of in the UK. The abolition of duty would reduce tax revenue, but the state spends ten times that subsidising housing costs that it constrains the supply of through planning restrictions. The state spends double that on contributions to the European Union. The state spends the same on subsidies to preferred industries. Of course abolishing Air Passenger Duty would mean demand for air travel would increase, and it would confront the spineless approach to airport capacity around London that has meant the government has vetoed expansion of any of London's three largest airports. Good. So it should. Get out of the way, and let Heathrow, Gatwick and Stansted expand without your interference, if their owners wish it. Naturally it benefits UK based airlines, which is why they are lobbying for it. Of course, why shouldn't they? It is a tax on their business. They don't get any specific services from the state that justify it, so Air Passenger Duty should go. It should go, not primarily because it would boost inbound tourism and reduce the costs of doing business from the UK to other countries, but because it is a tax on people undertaking an activity that not only generates business, but gives them pleasure. What about the environment? Well the argument that as aviation fuel isn't taxed it is "unfair" compared to land based modes, is ludicrous. The response to that is that it is equally valid to reduce fuel tax, and besides almost all rail services competing with airline services are electrically powered. In addition, fuel tax is not specifically an environmental tax. Air Passenger Duty is a tax on flying. It isn't for airports or air traffic control, and isn't about compensating anyone for noise or other pollution (nor could it or should it be so). There is an economic case for phasing it out, but more compelling, in my view, is the philosophical case. When UK residents fly, they do so either for business reasons or personal reasons. The business reasons are typically about generating wealth, and are good for that reason alone. The personal reasons can range from leisure to visiting friends and relatives to attending a funeral. The more of that people do, the happier they are, and as long as they pay their travel costs, there is no good reason for the state to tax them over and above that. Whilst Peter Cresswell makes much of my point for me, I want to add a couple of others. It's easy to criticise those who embrace the notion of Maori ethno-nationalism (that being a nationalism based not on a shared history of a common political body, but based on an ancestral heritage), who engage in patronising monologues about "partnership" and "engagement" and "dialogue", when anyone who disagrees with them is simply branded as racist and ignored. It's also easy to criticise those conservatives who are dismissive of anything Maori that makes them feel uncomfortable, who disapprove of the use of the Maori language, of Maori immersion schools (because they are Maori, not because they are state funded) or those who consent to using Maori customs on their own property or in their own business relationships, or indeed those who worship Maori supernatural beliefs. For after all, if people want to embrace a culture and a language in their personal lives and openly express it, that is their choice. However, what's largely ignored is that most people in New Zealand do not see Waitangi Day as a day to celebrate anything, except for a day off work. So many see it as a day when they will be reminded by people who are themselves elites, on well above average salaries, frequently paid for by taxpayers, claiming there isn't "justice". They will be reminded of the desire of these elites to take more of their money, through the state, to enrich a new generation of trough feeders. They will have noticed that a generation of settlements are not seen as enough by the loud and angry, a group who have been influential in teaching a new generation of young Maori to share their view of entitlement, and belief in the legitimacy if not the wisdom of using violence to achieve their aims. It isn't helped by a Race Relations Commissioner who is sympathetic to the view of those seeking to use the state as a way of extracting more money from everyone else. Most people see it as rent seeking, by those who have not personally suffered any specific loss, and more importantly, being paid for by those who did not create the loss. It is a sore around individual identity vs collective identity, and the role of the state in overriding the former with the latter. It is one Don Brash clumsily attempted to raise in the 2005 election (Kiwi/Iwi posters were scratching the conservative "dismissive of Maori" viewpoint, rather than confronting the strongly held belief that there is a small Maori elite gaining rents from the state). It is one that needs confronting, but wont be, as long as the Maori Party (which is patronised by such an elite) is necessary for a majority government. Evading the debate or labelling all those wishing to engage in it as racists, is not going to make it go away. Indeed, that very evasion is the source of vast clouds of irresponsibility that are allowed to wash over those who abuse their children, neglect their children and engage in a frenzy of mutual destruction of themselves and their whanau. My second point is simpler, and easier to confront. Titewhai Harawira is a thug. She brutalised the mentally ill, and she is treated as deserving respect because of her age. If she were a man of non-Maori descent, he would be treated by her sycophants and apologists for what he would be - a thug. The mere fact this woman, who attacked Maori who were vulnerable, is granted a shred of respect, is disgraceful. No one, Maori or otherwise, should give her a public platform and given the atrocious statistics for Maori on Maori crime, she should be ostracised, for she is part of the problem. A woman who normalised and institutionalised violence, and has never offered contrition for it. John Key should ignore her, should refuse to engage with her, and she should be told why. It's not her politics or that of her vile racist rent-seeking son (for there are many of that ilk), it's what she did. Those who express concern over racism always say they want people judged for their deeds. It's time to do just that. Titewhai Harawira is a violent criminal offender, let's treat her as such.